Ireland’s Ancient East is a magical, mystical place to visit. The landscape is lush and beautiful, and there are many tales of folklore that come from this particular area it isn’t surprising when you see how shrouded in mystery it really is. That, of course, is part of its charm, and it’s one of the reasons that so man visitors explore it every year. If you want to be one of these visitors and get the most out of your journey to Ireland’s Ancient East, just where should you be stopping off and what should you be looking for? Our guide will give you some useful insights so you can make up your mind about it all for yourself. Glendalough means the valley of two lakes, but its name really doesn’t do justice to the beauty that you will find there. Feeling completely at peace and at one with nature is what tends to happen here, and for those seeking enlightenment or just a break away from the hustle and bustle of the ‘real world’, Glendalough is often where they head. The history of Glendalough is just as playfully beautifully as the scenery. Legend has it that Kevin, a young nobleman, gave up his life of privilege to become a monk, and he chose to live in the remote area of Glendalough. He spent his time with the animals and birds and even had a blackbird lay an egg on his hand, which he then waited patiently to hatch, not moving in all that time. You can still see the grave slabs and burial places of ancient pilgrims. It is an evocative place indeed. 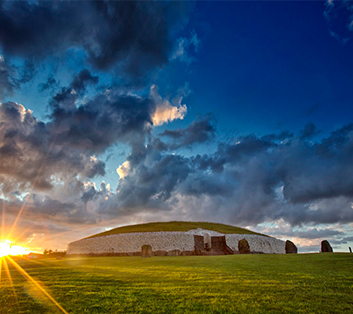 Newgrange is not a place as such it is a tomb, dated at 5,200 years old, and you can find it in the Boyne Valley. The tomb was built by farmers in the Stone Age, and it is impressively large, taking up around an acre of land. There is a passage inside it which, if you carefully follow it, will take you to three chambers, and those three chambers are perfectly aligned with the sun as it rises on the winter solstice. Being there makes you marvel at the cleverness of those ancient farmers who understood so much more than we could ever give them credit for. The Hill of Tara, also known as Temair, is a stunning, breathtaking place to be. This was once the seat of power in all of Ireland, and as many as 142 kings sat on thrones there over the centuries. In mythology, this was also the dwelling place of the gods, so it is easy to see how legend and truth have melded together to create some of the fascinating stories we hear today. When you arrive at the Hill of Tara you can feel the electricity in the air – it really is a powerful place and for anyone looking to experience something new and exciting, this is the place to go. Hook Lighthouse is the world oldest operational lighthouse. It was built an astonishing 800 years ago by William Marshal, a knight, and today you can enjoy guided tours around the place, listening to stories of Marshal and many others, as well as more modern lighthouse keepers. You will learn a lot by coming here, and it’s not every day you can say you have been inside a building that is 800 years old and was designed and built by a conscientious knight. The Copper Coast in Waterford is a UNESCO Global Geopark, which means it is a site of geological significance and must be protected. Run mainly by volunteers, the park has its own geologist to assist those who come to visit in identifying the rocks and understanding more about the soil that is to be found there. Not only can you explore for miles, but there is a lovely café, shop, and exhibition space too and many different events take place here. Our private tours are perfect for visiting the places you want to see along Ireland Ancient East.